The Operative Plasterers' and Cement Masons' International Association of the United States and Canada, also known as the OPCMIA, represents the members of one of the world's oldest and most noble crafts. OPCMIA members are the proud carriers of a tradition that predates the Pharaohs pyramids. As early as man was building shelter for himself, there was plastering - first with mud or clay and later with a lime mixture much like that used today. As society grew and man undertook projects to control and improve his surrounding, cement masons became a vitally important part of the community. Bridges, canals, dams, reservoirs, roads and many other engineering feats would be impossible without the skills of OPCMIA cement masons. Together with the plasterers and fellow building tradesmen, they have played a key role in shaping the world that surrounds us. As early as 1501, England's Henry VII granted the plasterers of that nation a charter to organize a guild with the central purpose of maintaining quality standards for craftsmanship and materials. The charter gave officials of the guild the right to inspect all plastering jobs and to levee fines for unsatisfactory work or use of cheap materials. To this day members of the OPCMIA are still concerned with quality control on the job. The craftsmanship standards of the European artisans were brought to America by immigrant plasterers of the 16th, 17th and 18th centuries before the United States was founded. These first American tradesmen have as their monument the beautiful colonial homes they decorated with elegance. As their numbers increased in the New World, the plasterers began to organize groups similar to the European guilds. These groups were generally organized by nationality. In New York, for example, there may have been a local union for English plasterers, a local union for Irish plasterers and one for Italian plasterers. The system was not the result of any intended discrimination or snobbery, but rather a way of doing things as they had always been done in the "Old Country." In some ways these new American groups were looked upon as extensions of the European guilds. There is evidence that a union card earned in Ireland, for example, could serve as a form of instant recognition for a plasterer seeking to join a local in his new country. Evidence indicates that the main function of the American locals, as the 1800's opened, was to ensure quality of craftsmanship. Each local sought to guarantee that the plasterers in its jurisdiction were properly trained and that they upheld the standards of the craft throughout their careers. By the early 1830's plasterers' locals were located in many North American cities. Thanks to inventions such as the steamboat and the train, America was becoming more mobile, and the nation was moving in a westerly direction. With the new mobility the plasterers union began to feel threatened. They were organized to work on a local level but they were running into problems beyond their scope and jurisdiction. For example, it was becoming common for a plasterer who belonged to one local to accept work in another area. This usually resulted in the worker being required to pay dues to two locals-his home union and the local which had jurisdiction over his temporary workplace. On other occasions apprentices would run away from their programs before completion and would present themselves to employers or other locals as full-fledged journeymen. And while there was a great deal of cooperation among locals, all too often such deceits were effective, thereby undermining the quality of the craft and weakening the locals. Although a fire destroyed most records of the union's early history, making exact dates impossible to document, it is believed that the problems faced by the locals brought them together just before the Civil War in a group known as the National Plasterer's Union (in some accounts it is referred to as the National Plasterers Organization). Before the group really had a chance to prove itself, however, it was overwhelmed by the war. In 1864, with the war still in progress, the organization was revitalized. Its purpose was to regulate, standardize and promulgate the different scales of wages and working conditions, to establish a traveling card system, to institute apprentice training and regulations on a standard basis and to acquaint local unions with the names of unworthy members who had to be disciplined or otherwise penalized as well as the names of incompetent applicants for membership. In early 1882 the Cincinnati local union went on strike for higher wages and, after a sixteen-week standoff, the union achieved its demands. During the course of the walkout, the Cincinnati local had requested financial aid from the other plasterers' locals. Various local leaders responded generously to the appeal, and in the process of uniting behind their brothers in Cincinnati, began to discuss the idea of reviving their national group. It was agreed that representatives of the locals would meet in St. Louis in September 1882. The result of this landmark gathering was the rebirth of the national organization. While sources on this convention are scarce, some important results of the meeting are known. It was at this convention that the name Operative Plasterers National Union was adopted. We also know that Michael Mulvihill of Cincinnati was elected as the union's first president and that Mr. J. J. Kennedy of Cleveland was elected secretary. The new secretary was directed to contact each Plasterers local union and urge immediate affiliation. Eighteen delegates came to Cincinnati for the union's second annual convention in July of 1883. At the convention new officers were elected including James W. Smith of Philadelphia as president. Two resolutions that would become important parts of the union's legacy were also adopted. The first dedicated the national union to the concept of the eight-hour day, the second encouraged local unions to do everything in their power to "honorably avoid" unnecessary strikes. In the early part of 1885 the local plasterers union of Toronto applied for affiliation, but as the constitution of the national union provided for jurisdiction only over the United States, the application was denied. At the 1887 convention, how ever, the constitution was amended to include Canadian affiliation and the name of the union was officially changed to Operative Plasterers' International Union (OPIU) of the United States and Canada. By the 1890's, the OPIU had made dramatic progress on behalf of its members. By 1898, the eight-hour day had been established in the plastering industry, and recognition of the Saturday half-holiday had generally been achieved. The early 1900's brought many innovations in union activities. In 1907, with the publication of "The Plasterers," OPIU began a tradition of labor press excellence that continues to this day. In 1908 OPIU was one of the building trades unions affiliating with the American Federation of Labor as part of the newly formed Building Trades Department. In 1914, in recognition of the growing number of cement workers who had come into the union, the name of the group was officially changed to Operative Plasterers' and Cement Finishers' International Association. In July of 1915 an agreement was reached with the United Brotherhood of Cement Workers which provided that the Cement Finishers who made up that union would be admitted to the OPCFIA. Through this process of merger, organizing activity and growth in the construction industry the Operative Plasterers' and Cement Finishers' International Association continued to grow. Along with other construction unions, the Operative Plasterers' and Cement Finishers' International Association suffered a severe blow with the Great Depression of the 1930's. Unemployment in the building trades soared. Despite the tremendous obstacles created by a failing economy, the OPCFIA continued to move forward. Responding to the increasingly important role that the federal government was beginning to have in its members' affairs, the union opened a Washington office in the late thirties. America went to war in 1941 and members of the Operative Plasterers' and Cement Finishers' International Association served the cause in a number of ways from completing defense projects well ahead of schedule to volunteering for the often hazardous duty of the Navy's Construction Battalions or "Seabees." Even before the United States became involved in the war, Canadian OPCFIA members were serving their country in its war efforts. As in the U.S., Canadian building tradesmen answered their nation's call with complete dedication. As World War II came to a close, one of OPCFIA's chief concerns was maintaining construction quality that can only be provided by skilled craftsmen. The thousands of men returning from the service and anxious to get into jobs in an industry converting to civilian production were a threat to this quality. Construction boomed with the peacetime conversion, but in the eyes of experienced building craftsmen who made up the OPCFIA, too many corners were being cut in the rush to build. Responding to the quality issue, the union established the National Foundation for Lathing and Plastering in 1945 to stem the movement toward inferior materials. The Foundation, a joint Lathers' union industry program, spread the message to architects, engineers, contractors, public officials and the public: plaster is a superior material for which there is no quality substitute. As the nation adjusted to the post-war environment and the economy began to build up steam, the demand accelerated for the Cement Finishers represented by the OPCFIA. 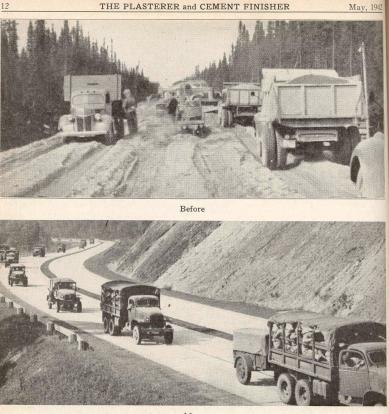 Highways, bridges, hospitals and school buildings were desperately needed, along with a multitude of other projects involving concrete work. Reflecting the fact that its members did more than finish cement, the union changed its name in 1951 to the Operative Plasterers' and Cement Masons' International Association. As part of its long-standing tradition of pursuit of excellence, the OPCMIA, in the post-war era, began to establish apprenticeship to assure a constant supply of highly skilled craftsmen. Just as the OPCMIA advocated use of quality materials, it also demanded quality Plasterers and Cement Finishers who were properly trained in the craft. 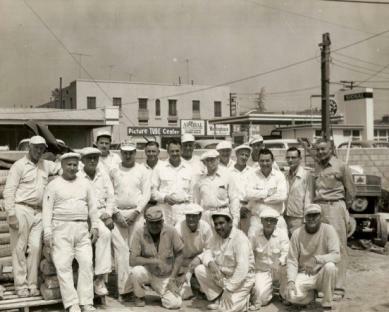 In 1946 the union joined with the Contracting Plasterers' International Association and the Associated General Contractors to establish the National Apprentice Training Standards. Through this program the union was able to guarantee a steady flow of qualified Plasterers and Cement Finishers to an ever-expanding construction industry. Working closely with the Veterans' Administration, the union indentured a large number of returning servicemen into apprenticeship programs. 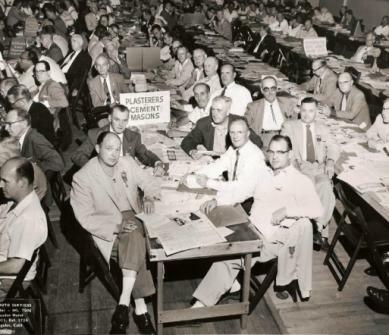 During the 1950's the union found itself dealing with challenges familiar to every building trades union. As the economy expanded with its constantly increasing demands on construction, the union fought hard to maintain the high quality of materials and high levels of craftsmanship in the industry. It worked with equal perseverance to ensure that its members earned fair wages and to build the membership through organizing. More and more, the OPCMIA was drawn toward the nation's capital in its efforts to preserve and expand on programs for its members. This required closer proximity to the federal government where many of the policies affecting unions were being formulated. The Washington office opened in the late thirties was no longer sufficient. In 1960 the OPCMIA moved its headquarters from Cleveland, Ohio to Washington, D.C. In its new location the union was even better prepared to face the challenges of the new decade. 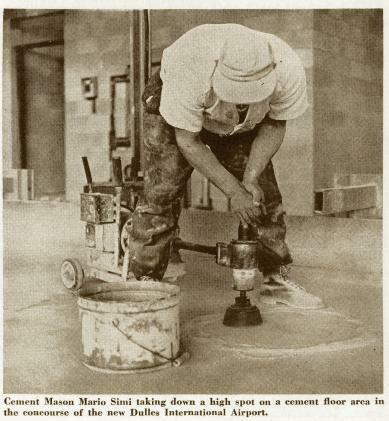 As the 1960's began, cement masons proved as critical to peacetime defense projects as they were to the war periods. Across the country skilled craftsmen constructed the silos for intercontinental missiles designed to deter the threats of war. In accordance with a request from President Kennedy, cement masons joined other building tradesmen in a no-strike pledge covering crucial defense projects. As the decade of the 1900's got underway, the OPCMIA was caught up in the spirit of change. Re-evaluation and reform were the order of the day in American society. Along with other organizations of the labor movement, the union used its considerable political and economic influence to help bring about the reforms called by great leaders such as John F. Kennedy, Robert Kennedy and Martin Luther King, Jr. The union wholeheartedly supported passage of the landmark Civil Rights Act of 1964, which set the nation down the road to true equality for every citizen regardless of race. The OPCMIA also sought passage of the Great Society legislation proposed by President Johnson in order to free thousands of Americans from the cycle of poverty. In addition to fighting for legislation to improve the lives of minority citizens, the union joined with other building trades unions in an effort to increase minority employment in the construction crafts through apprenticeship training. Young blacks and Hispanics were brought into the apprentice programs, opening the doors to jobs on construction sites across the nation. The Operative Plasterers' and Cement Masons' International Association continues to play a decisive role and work diligently on behalf of its members. Today, the OPCMIA is strong and building on its past, looks forward to the challenges of the new millennium. Over a hundred years after that first gathering of concerned craftsmen, this union continues to live by the principles upon which it was founded and which will continue to be its strength in the new millennium.